When a person reaches age 68 and reflects on more than 40 years of highly successful service with one organization, it’s logical his thoughts start turning to retirement. 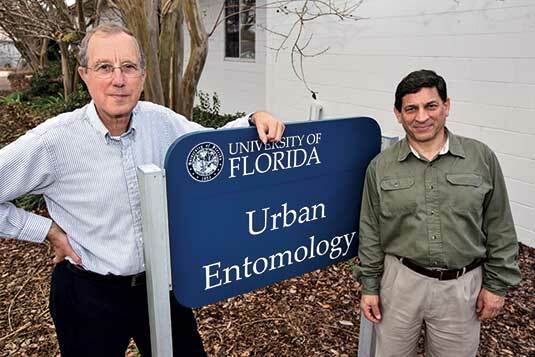 Dr. Koehler points out the university has put together a good staff, including Dr. Roberto Pereira that has helped the Florida urban pest management industry. He played a key role creating a professional industry in Florida by offering various training programs for pest management professionals (PMPs), conducting research that provides the industry with meaningful information and working with students looking to step into industry positions. Recently, the university hosted the 20th Southeast Pest Management Conference — an event Dr. Koehler helped start and nurture. The educational conference attracted a record-breaking 400 professionals this year. The large attendance was due in no small part to the marquee names of several University of Florida entomology graduates who participated as presenters. NPMA CEO Bob Rosenberg, a UF graduate, also was invited. Several UF entomology graduates who now represent top-notch manufacturing and supplier organizations attended as well. The success of the conference helped advance the reputation of the university’s entomology and nematology department. Now Dr. Koehler is looking to the future. Dr. Koehler is focusing his research on ways to help PMPs specialize in “handling things people fear.” He believes specialty insect work, such as bee control, is already being done in Florida. UF is also conducting mosquito control research, he says. Dr. Koehler, a Pennsylvania native, received a bachelor’s of arts degree in biology from North Carolina’s Catawba College in 1969 and a doctorate in entomology from Cornell University in 1972. He served as a Lieutenant medical entomologist in the U.S. Navy for three years. When he arrived in Florida in 1975, he was hired as extension entomologist. But he found there was a considerable difference between dealing with public health pest problems in a military setting and helping PMPs better their businesses through training seminars. His wife, Adele, and sons Tim and Andy were able to still secure some family time with the busy professor, when he was able to focus on developing a teaching and research program on campus. Although neither son followed in their father’s footsteps, they each earned doctorates in engineering. 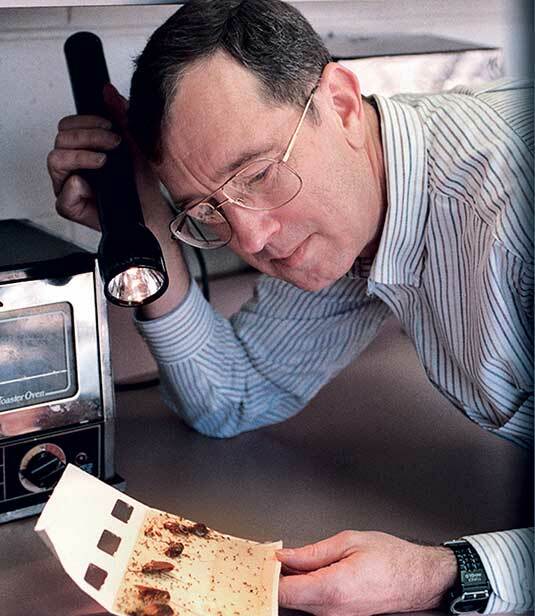 Dr. Koehler is lauded as an inspiring speaker, educator and mentor, but his true passion is pest research. In 1995, he helped raise more than $600,000 to build the Urban Entomology Building on the UF campus. The facility enabled Dr. Koehler and his students to start conducting the research that focused specifically on the needs of Florida PMPs. His research areas included German cockroaches, ants and fleas, but since then he has gradually moved from flea research to an emphasis on non-repellent soil termiticide testing. As his research intensified in the late 1990s, Dr. Koehler talked to the industry about supporting a significant research program that was pertinent to PMPs in Florida. Recently, his program expanded to include mosquitoes, flies and bed bugs. In 1999, Dempsey Sapp Sr., founder of Gainesville-based Florida Pest Control and Chemical Co. (and a member of the 2014 class of Hall of Fame) wanted to support the endeavor and challenged his Florida colleagues to follow his lead. Sapp and his wife, Margie, created the Endowed Professorship in Structural Pest Control with a $1 million donation. Matching funds from the state then added $750,000. The FPMA heeded the call as well, raising $600,000 for the FPMA Endowed Professorship for Urban Pest Management. Drs. Koehler and Roberto Pereira in front of home base, the Urban Entomology building. University officials advertised the two professorships inside and outside the state, yet they concluded the best person for the job was right under their noses. Dr. Koehler was named to both positions. He showed his dedication to the industry by investing the interest from the funds into scholarships and projects. Seeing the significance of sharing research and education globally, Dr. Koehler and his staff launched UF’s entomology department’s distance education program in 2000. Through the program, certificates in urban pest management are offered to students all over the world. “These are highly motivated students who are working in the industry, and want to learn more,” Dr. Koehler says. Jerry Mix served as editor and publisher of PMP for more than 20 years, and is a member of the PMP Hall of Fame (Class of 2005). You can reach him at jnmix@aol.com.